The Nicky Clarke NHD152 2000W Diamond Shine Hair Dryer boasts a real diamond infused grille and features ionic technology that combine to promote shiny, glossy and frizz free hair at home. With a 2000w AC motor, the Nicky Clarke NHD152 2000W Diamond Shine Hair Dryer brings pro salon performance into the home to give you the highest possible standard blow dry. It features 2 speed settings and 3 heat settings as well as a cool shot and 3m cable to place maximum control in the palm of your hands. The styling concentrator included can be used to direct the airflow for precision styling and added shine, just like the professionals. 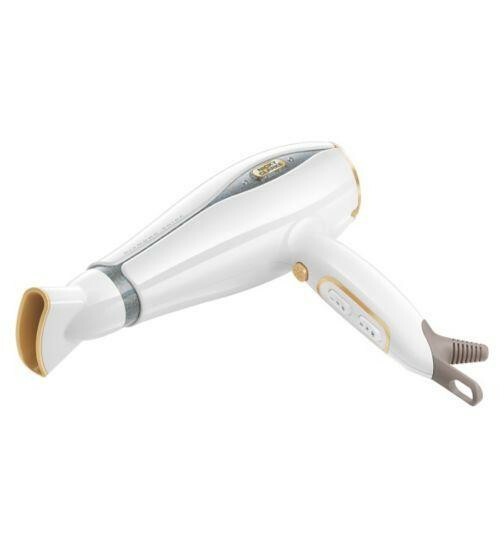 The secret to this great Blow Dryer is the combination of technologies, using a ceramic coated grille infused with real diamonds and ionic technology to dry hair evenly, avoid heat damage and a smooth, frizz free blow dry with great looking gloss.